So the day had finally arrived: Stew's farewell gig. 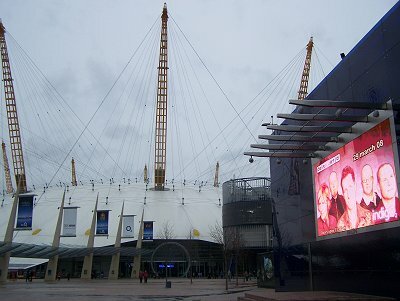 The venue, 'The Indigo2' is located inside what was once known as the Millennium Dome, now rebranded as 'The O2'. It's a huge and impressive structure, visible from miles away. As I left the tube station I caught sight of a huge video screen just outside the main entrance, advertising the Delirious? concert. Having arrived way too early and unable to reach Jon on the phone, I wandered around inside the O2 and eventually bumped into a few familiar faces (Clare, Tom and EEB from the forum). Later as I walked back past the Indigo2 I ran into Martin and Jon who escorted me inside. Jon gave me a quick guided tour of the venue, a fresh new trendy building with excellent facilities. 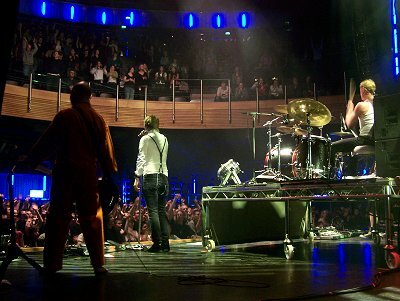 The view from stage looked great, and the crowd were close to the action on both floor and balcony levels. We headed behind the stage to the dressing room area where crew members were mingling, waiting for show time. I sat amused at Jon and Lee (guitar tech) questioning each other on the merits of the new songs. Before long the man at the center of attention entered the room. Stew looked a little nervous but still greeted me with a smile and a hand shake. I asked how he was feeling and he admitted to feeling a little strange. A few weeks back I had been due to carry out an interview with Stew, but he'd requested we do it face to face tonight instead. So with less than an hour remaining till the band were due on stage, Stew and I headed to an empty dressing room and settled into a couple of chairs. It took me a few minutes to set up my laptop to record the interview, so we chatted for a few minutes without the pressures of a tape recorder. He seemed fairly relaxed but said he was worried about 'holding it together' for the show. I asked if he had many friends and family coming tonight. Rather impressively he said that he'd personally added 80 people to the guest list! 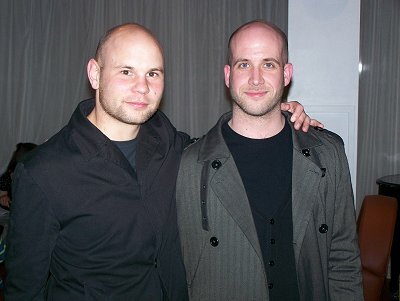 We began the interview, and concious of the fact that he probably didn't want to spend too long talking about his decision to leave the band so close to his final gig and with his family waiting around outside for him, I deliberately cut a few questions out and kept the interview to under 15 minutes. He gave candid and open answers, talking clearly about some of his highlights over the years and his thoughts about the future of the band. The interview will be available on my site soon, but a few interesting points were his insistence to the band that if they were going to split up because of him leaving, then he wasn't going to leave. He also gave plenty of hints that the mainstream still holds a future for d:. Some very interesting thoughts. As we finished, I presented Stew with a Leaving Card that the forum had collectively contributed to. He was clearly touched by the gesture, although he understandably said he'd leave reading all the comments for a less emotional day! By now the main back stage area was getting pretty busy, about half an hour till show time. JB from Fierce was there and we had a chat about a few things, including the superb special packaging for Kingdom Of Comfort. Fitting it on your CD rack will be a problem, but it's well worth the inconvenience! Finally the band made their way along the under stage corridor (plenty of low beams holding up the stage to bump your head on) and onto the side of stage where the DJ was finishing his support slot. Jon whispered in my ear that this was going to be the strangest start of show ever. "Why?" I asked. "You'll see" he replied. Stew walked out onto stage, climbed onto his drum riser and saluted the crowd. Suddenly Jon and the rest of the band pulled pairs of tights over their faces, armed robber style, and walked onto stage. Now I understood. The security at the Indigo were extremely friendly and helpful, not once attempting to stop me taking photos or standing somewhere. Definitely a breathe of fresh air for me. No matter how shiny your AAA pass, there's usually at least one security guy ready to give you a hard time. But tonight they were happy to glance at my pass and let me get on with what I wanted to do, even pointing me in the right direction when I was unsure about the routes backstage. Having ventured down to the photographers pit (empty all night apart from me, and occasionally Hutch) and upstairs to the balcony, I then spent much of the show stood 2 meters to Stew's left, just behind a black curtain at the side of stage. 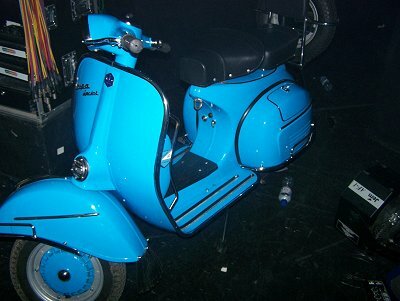 I wanted to take as many photos (and a few videos - more on that another time) of Stew at his final UK show as I could. Several times Stew glanced down at me. He was clearly enjoying the show and giving it everything he had. 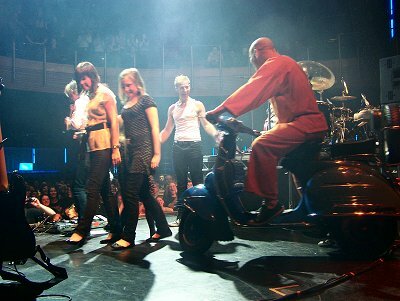 During the encore Stew's wife and two daughters were brought on to stage, and then behind Stew's back, Jon rode onto stage on a Vespa. 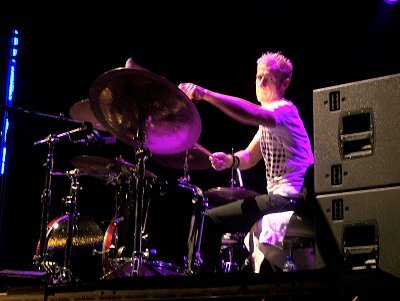 I managed to capture the moment as Stew turned round to see the farewell gift from his band mates (see above). The look on his face was classic. Utter surprise, amazement and delight. The bike was wheeled off stage and the finale completed with a stunning rendition of Investigate. 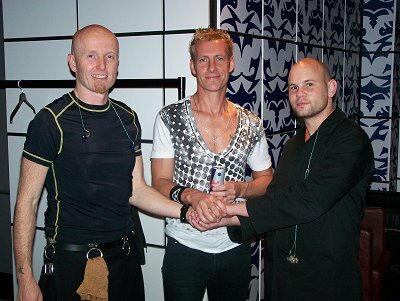 As the band left the stage Stew gave me a sweaty hug, and I was impressed to see he'd managed to hold back any tears. "What a night!" everyone said. The band returned to their dressing room and huddled together in private. I headed back out into the venue and caught up with a few forum people. Returning backstage I went up several flights of stairs to the VIP bar area where the after show party was taking place. Jon brought a certain Mr Paul Evans over to chat to me. He's a very nice guy and seemingly undaunted by what lies ahead for him in about a months time. He confessed to having already had a sneaky look around the forum, so I suppose he's well aware of what he's letting himself in for! After a drink and lots of chatting, I had to tear myself away to catch the train home. A remarkable and emotional night, but definitely not the last we'll hear of Stew.